Catholicism has grown from a suppressed and persecuted outsiders' religion in the American colonies to become the nation's single largest denomination. James Fisher surveys more than four centuries of Catholics' involvement in American history, starting his narrative with one of the first Spanish expeditions to Florida, in 1528. He follows the transformation of Catholicism into one of America's most culturally and ethnically diverse religions, including the English Catholics' early settlement in Maryland, the Spanish missions to the Native Americans, the Irish and German poor who came in search of work and farmland, the proliferation of Polish and Italian communities, and the growing influx of Catholics from Latin America. 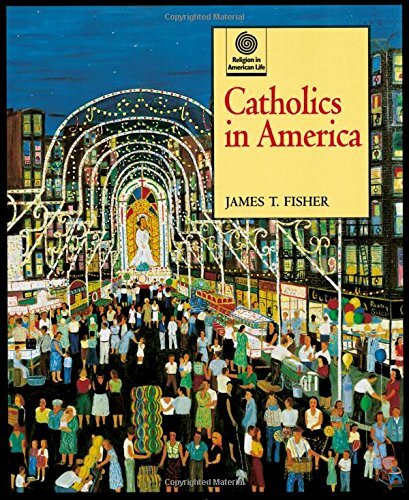 The book discusses Catholic involvement in politics and conflict, from New York's Tammany Hall to the Vietnam War and abortion. Fisher highlights the critical role of women in American Catholicism--from St. Elizabeth Seton and Dorothy Day to Mother Cabrini, the first American citizen to be canonized a saint--and describes the influence of prominent American Catholics such as Cardinal John J. O'Connor, 1930s radio personality Father Charles Coughlin, President John F. Kennedy, pacifists Daniel and Philip Berrigan, activist Cesar Chavez, and author Flannery O'Connor. Religion in American Life explores the evolution, character, and dynamics of religion in America from 1500 to the present day. Written by distinguished religious historians, these books weave together the varying stories that compose the religious fabric of the United States, from Puritanism to alternative religious practices. Primary source material coupled with handsome illustrations and lucid text make these books essential in any exploration of Americas diverse nature. Each book includes a chronology, suggestions for further reading, and index.